Christmas morning means one thing: it’s officially time to open presents! However, it’s not just humans who get to partake in the fun. 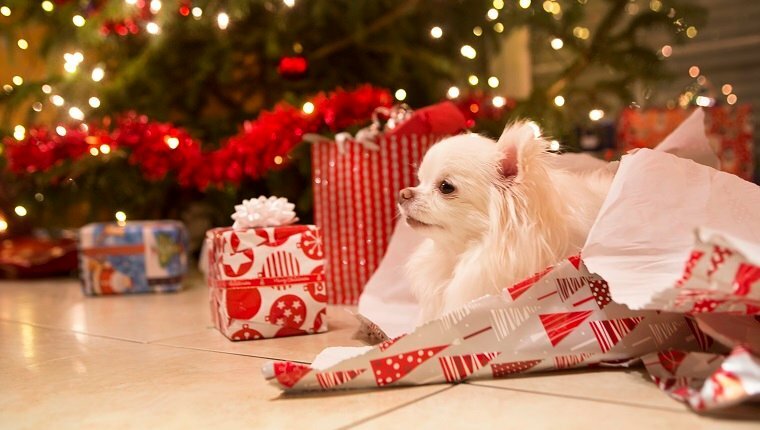 Your dog is a part of the family, after all, which means they should get to open gifts, too. A dog opening up their Christmas present is the definition of cute. Here are some of our favorite videos of dogs reacting to their very own Christmas presents. If you decide to get your own dogs a present this Christmas, just make sure to be safe! Always supervise if you’re going to let a dog open their own presents, and avoid choking hazards. These two Labradors named Muffin and Molly could not be more excited to open their presents. Not only are they happy about the gifts, but they are even dressed up for the occasion in cute Christmas costumes! From their garments to their excitement, these guys are definitely getting in on the Christmas spirit. They act just like kids on Christmas morning, and it’s priceless. Sometimes your doggies need a little assistance opening presents. These three cute Siberian Huskies may be excited about their gifts, but they have some trouble understanding the concept of ripping the wrapping paper. Thankfully their humans have opposable thumbs and come to the rescue. One of them is so happy she starts eating the bone before it’s even fully unwrapped. These three Dachshunds cannot contain their excitement for Christmas. Even before their owner gives them their presents, the three of them can’t stop wagging their tails, jumping on their hind legs, and staring at the gifts. These dogs are just like children on Christmas Eve who can’t sleep because they are so excited to open their presents. This video proves just why every dog should be a part of the fun of Christmas. In this sweet and heartwarming video, a rescue dog opens a Christmas present for the very first time. At first he is a bit unsure of what to do, but with a little reassurance from his owner, he gets it! He is obviously a very smart doggo because he figured out how to get the toy out of the wrapping paper all by himself. This video most definitely represents the spirit of Christmas. What’s better than one dog opening Christmas presents? A compilation of dogs opening presents, of course! This video features all types of dogs from Poodles to French Bulldogs participating in the Christmas present opening. No matter the breed, it seems that all dogs share in the enthusiasm of opening Christmas gifts. In each clip the dogs cannot stop wagging their tails. Christmas presents and dogs are the perfect combination! Bob and Tucker the Beagles are celebrating their first Christmas ever. Watch as these two adorable pups eagerly open their present together. Even before their owner gives them their gifts, they are staring at her with the classic puppy dog eyes. How could you not give these two presents? In the chaos of the doggies’ excitement, Tucker hilariously gets the bag stuck on his head while trying to get his gift. Maggie the Australian Cattle Dog has a very unique way of opening presents. Instead of tearing at the gift wrapping with her paw or biting it, Maggie decides to try a new technique. She aggressively shakes her head and the present back and forth in her mouth. She is definitely determined to open her present no matter what it takes! It looks like her method works because, through the hilarity, she manages to get it open. Toby the Golden Retriever is a professional Christmas present opener. However, Darla the Pug-Boston mix is a professional Grinch. Every time Toby opens his present, Darla swoops in and steals his gift and runs away. The funny part is that Toby seems to really enjoy opening gifts, so he doesn’t mind as long as he gets to just open another present. Maybe one day Darla will learn to have better sharing skills. Nothing says you love Christmas more than literally rolling around in your presents. This dog is so thrilled about the holiday that he rolls in a pile of his gifts and wrapping paper. Now that is one spoiled pup! These dogs appear to really love Christmas because they are completely surrounded by a mountain of presents. Their life doesn’t seem all that bad, to be honest. Wouldn’t you love to switch places? Savannah is one patient dog. She is very well-trained and waits specifically for her owner to tell her it is okay to open her present. Unlike some naughty kids who open their presents early, Savannah knows she is not supposed to open her presents until her parents tell her. She even knows immediately which gift is meant for her just by the smell and doesn’t go after the human presents. Savannah is the type of dog every owner wishes they had. Do you give your dogs Christmas presents? Let us know in the comments below!